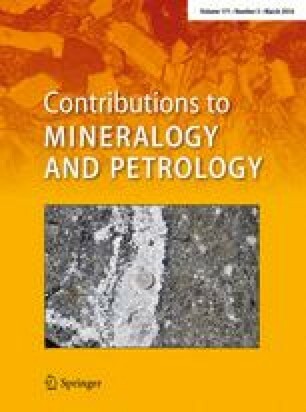 An unusual occurrence of Pt-enriched pyroxenites in the Monts de Cristal igneous complex is characterized by unusually high ratios of Pt to other platinum-group elements (PGEs) and very low Cu and sulfide contents. Synchrotron X-ray fluorescence microscopy was used to identify over a hundred discrete grains of platinum minerals and relate their occurrence to textural associations in the host heteradcumulate orthopyroxenites. Element associations, backed up by FIB-SEM and PIXE probe observations, indicate that most of the Pt is associated with either As- or trace Cu–Ni-rich sulfides, or both. Some of the Pt–As grains can be identified as sperrylite, and most are likely to be Pt–Fe alloy. The relative abundances and volumes of Pt minerals to sulfide minerals are very large compared with typical magmatic sulfides. Almost all of the grains observed lie at or within a few tens of μm of cumulus orthopyroxene grain boundaries, and there is no significant difference between the populations of grains located inside or outside plagioclase oikocrysts. These oikocrysts are inferred to have crystallized either at the cumulus stage or very shortly thereafter, on the basis of their relationship to Ti enrichment in the margins of pyroxene grains not enclosed in oikocrysts. This relationship precludes a significant role of trapped intercumulus liquid in Pt deposition or mobilization and also allows a confident inference that Pt-rich and Pt–As-enriched phases precipitated directly from the magma at the cumulus stage. These observations lead to the conclusion that fractionation of Pt from other PGEs in this magmatic system is a consequence of a solubility limit for solid Pt metal and/or Pt arsenide. The online version of this article (doi: 10.1007/s00410-016-1232-1) contains supplementary material, which is available to authorized users. This research was carried out on the X-ray fluorescence microscopy beam line at the Australian Synchrotron, Clayton, Victoria, Australia. We acknowledge financial support for this facility from the Science and Industry Edowment Fund (SIEF). We thank Martin de Jonge for his programming of complex scan control scripts and Kathryn Spiers for beamline assistance during the experiment. James Mungall provided helpful reviews of a preliminary draft. This work was supported by the Multi-modal Australian ScienceS Imaging and Visualisation Environment (MASSIVE) (www.massive.org.au). We acknowledge the support of the National Resource Sciences Precinct through the Advanced Resource Characterisation Facility for access to the FIB-SEM. We thank David Holwell, Raul Fonseca and Associate Editor Christian Ballhaus for helpful and constructive reviews that greatly improved the final paper.